We believe that transportation is the precursor to building new communities not the other way around. The large mistake that was common practice of past governments was to select a piece of land in the desert and build a number of buildings, which lacked the necessities of a normal community that did not provide adequate, consistent and scheduled transportation. We believe that building a transportation route that is aimed to reach a big city will create small communities (satellite towns) to be erected along its routes. We envision that many communities will be erected thru this national project on mainland as well as in Sinai. Sinai is mainly mountains but on its coasts there are flat lands that can be used to build these new communities, not just for tourism but also for other industries. Many may make a rapid opinion that this project will compete and take business away from EgyptAir or any other private transportation. Our answer based on research is this is a multi faceted project, it complements the new housing delta project (Cairo to Ismailia and Cairo to Suez), agriculture expansion to save the Nile delta, promotes domestic and international tourism, establish new industrial villages and interconnects with Saudi Arabia for deeper bilateral economic relations. We recommend that EgyptAir would be an investor in this project and to provide hosting and dining services. We see EgyptAir complementing this project. We conclude that it is a vital project that must be implemented to take Egypt to another level. 10) Increases the flow of tourists to and from destinations. High speed rail delivers fast, efficient transportation so riders can save time, energy, and money. 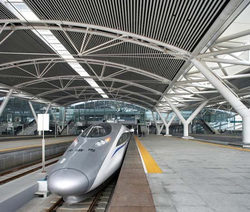 High Speed rail is extremely reliable and operates in all weather conditions. It is not subject to congestion, so it operates on schedule every day without delay - especially during rush hour and peak travel times. High Speed Rail spurs the revitalization of cities by encouraging high density, mixed-use real estate development around the stations. It also fosters economic development in second-tier cities along train routes. It links cities together into integrated regions that can then function as a single stronger economy. High Speed Rail broadens labor markets and offers workers a wider network of employers to choose from. It encourages and enables the development of technology clusters with fast easy access between locations. It also expands visitor markets and tourism while increasing visitor spending. The many benefits High Speed Rail delivers spread throughout regions that have High Speed Rail, encouraging economic development across a large area. We envision that thousands of jobs during and post construction will be created. All materials used are available in egypt except the Locomotive and passenger cars. for the tracks, cement base, metal rails, sleepters and other metal objects. We suggest in the first stage to purchase the locomotive and passenger cars and the next phase build them in Egypt under the Arab Organization for Industrialization, SEMAF factory (http://aoi.com.eg/aoieng/factories/semaf.html) which currently builds passenger trains and metro passenger cars. They would build these under license to ensure quality and engineering support. The Railway traction equipment and other components would also be manufactured in Egypt when the engineering drawings are supplied by the implementing company that will oversee the whole project. 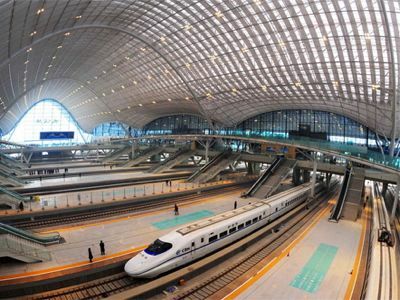 To construct 1255 km of tracks, 44 Stations (1 Hub station, 3 Airport Terminal Stations, 40 small stations). Sharm Elsheikh – El-Madina (700 km) HS – On the Saudi side. 1) It will support the new housing delta project from Cairo to the Suez. 2) will lead into the western side of Sinai where El-Tor is located and other new towns, which will promote development in Sinai. 3) Will lead to Sharm El Sheikh which will enhance tourism in Sharm El Sheikh by increasing the volumes becuase transportation will be less expensive and more convenient and passengers can hop on to go to Sharm Elsheikh from mulitple locations. 4) will lead into Saudi Arabia to Medina which will promote tourism from the gulf and enhance and increase travellers for religious trips, therefore increasing revenues. * 20 passenger cars and locomotive. This is a typical passenger capacity. * High speed for express long destinations (300-340km/hr) and conventional for short trips, but all use the same new type of tracks. * Hub Station: Consists of commercial area, restaurants, short and long-term parking. There will be only one Hub station (If the geography permits). 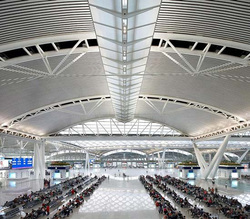 * Airport Stations: Integrated hall in the airport or nearby airport. * Small stations: will consist of short and long-term parking, but limited commercial outlets. All small stations will have the same design. parking spaces (Short term and long-term). Parking lots will be gated/security monitored. Proposed Routes to boaster investments and to decongest population and to create new satellite towns or the development of existing towns. 3. Cairo airport – integrated into all halls. 3. Cairo airport –Integrated into all halls. 1. Suez Mainland – to under canal road/rail tunnel or above canal. The Chairman of Foreign Trade at the Egyptian Ministry of Commerce, Hussain Omran, said such a causeway would increase trade between the two countries by more than 300% from the present $4.2bn a year to more than $13bn in two years. Hisham Zazoua, senior assistant to the Egyptian Minister of Tourism, expected the causeway to increase the number of Saudi tourists visiting Egypt every year to more than 1.2 million from the current 300,000. Therefore, the above numbers will further increase because of the this railway project. Ismailia – Marsa Alam (approx. 650 Km) HS Trains are not used for multiple stops, therefore there can be commuter trains on this route. Cairo to Ain Sokhna is not depicted here but can be analyzed in depth with all that is proposed. According to Eng. Mohamed Said Ali Dawoud - Projects , Research & Design Sector Director at Semaf Railway Factory – Arab Organization for Industrialization: The project for the establishment of the high speed train inside Egypt and the Middle East is a good project for civilized future transfers in the region to a new era that leads to keeping up with the development of the world for being dependent on railways for creating new societies with a better future. As for the estimated prices, it depends on specific characteristics, and estimate for per air-condition electrical train which consists of 10 cars with the required speed will costs nearly $20,000,000 (twenty million dollars). As for establishing the rail it will cost in the range of $2,000,000 (two million dollars) for per kilometer (each way) according to type of soil this plus costs of establishing the electrical network and the stations. These prices are Discretionary at least within the next five years. Eng. Mohamed Said Ali Dawoud is a Contributor to projects for Egypt. Note: The cost of an airplane that carries 70 passengers is approx. $100 Million, in comparison to a train that carries 1000 passengers would cost $40Million. The train would make more frequent trips and will be more profitable. -Samy Ashour. Small stations: If we allocate $5 Million for each modernly designed small station, each station will have platforms for both directions, kiosks for ticketing, limited commercial space, and paid parking space for 300 cars (gated/Long and short-term paid parking). Approximate cost for the whole project of one line. The above numbers/estimation is rough and are based on experts in the field but should not be taken literally. The above displays the routes from the new Hub near Cairo which will service the east nile region and stations on the west at 6th of October which will service the west nile region. the dashed red and yellow is negotiable path,from cairo to 6th of October via Ramsis or the path should be direct from the new hub to 6th of October. The Egyptian Rail system will integrate with the Haramain High speed rail which is being constructed (Red Line). We are proposing extending that rail upto to Tabouk and to the Saudi Egyptian Causeway. The new Egypt Railway System will be an integral part of the arab railway system - Not discussed here. Extending from Libya to the heart of Egypt onto Sinai (Asia) and onwards to Al-Madina Alminawara and finally to the Gulf nations. A railway system that will bring many glad tidings to Egypt. Will boost investments, tourism and unity. A trip from Cairo to the UAE would take 9 hours. A trip from Cairo to Al-Madina Elminawara would take 3-4 hours. More economical than an airplan. 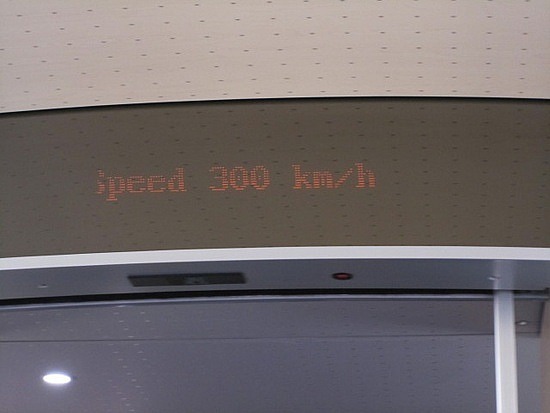 A typical train can load 1000 passengers. The locomotive and 20 passenger cars. Typical Hub design below with multi platforms. Small station rendering - Parallel of highway, with parking opposite side. The Overhead Wire (also known as Catenary). The overhead wire ranges in voltage from 675-925 volts, averaging around 750 volts, direct current.